A beautiful addition to any coastal-inspired table decor. Perched atop a small rectangular grayish-white base, connected by just a thin strand of metal, it looks to be floating over your table. 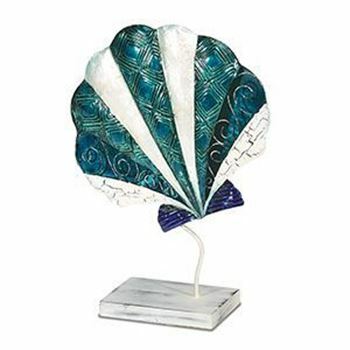 The gorgeous coloring of the shell makes it a real standout. Alternating panels of delicate ivory, richly patterned green and deep blue with an ivory design give it a unique look and feel.